Watch Fred VanVleet disrupt the Nets with positioning, Olympiacos' clever wrinkle on a set the Celtics run, and another example of how the Spurs machine never stops. At the high school and college levels, gap positioning is a key part of a defense that stops dribble penetration and forces difficult shots. What is gap positioning? A defender who is one pass away from the ball will shift off his man and position himself in the gap between the the ball and his man. That puts the defender in position to discourage the drive, lending assistance to the defender on the ball and shrinking the court. At the NBA level, though, gap positioning is not emphasized nearly as much. 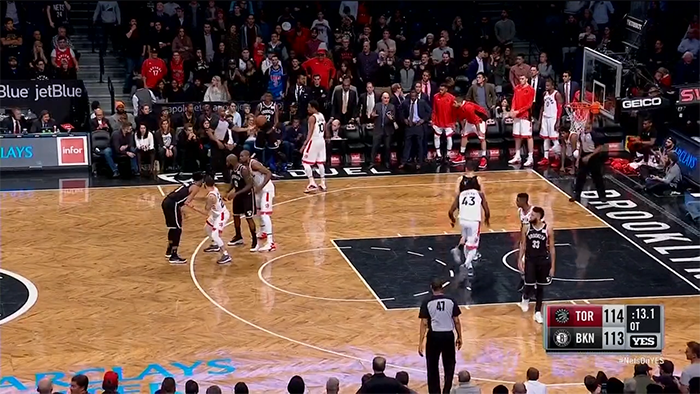 With the longer three point line and the high skill levels, there is so much more space on an NBA floor. If a defense followed the rule that some high school and college teams teach (half way between ball and man), they’d be giving up easy open looks to shooters. NBA defenders shift off their men, but not nearly to the degree that coaches would teach at the lower levels. VanVleet is able to be so aggressive in the gap because of situation and court positioning. In a normal game situation a defense is trying to minimize the opponents’ points per possession. But with Toronto clinging to a one-point lead at the end of the game, what matters most is whether Brooklyn gets any points at all, not *how many* they get. And the Nets are more likely to get at least one point on the board by driving the ball toward the basket for a layup or foul than by casting away from the perimeter. 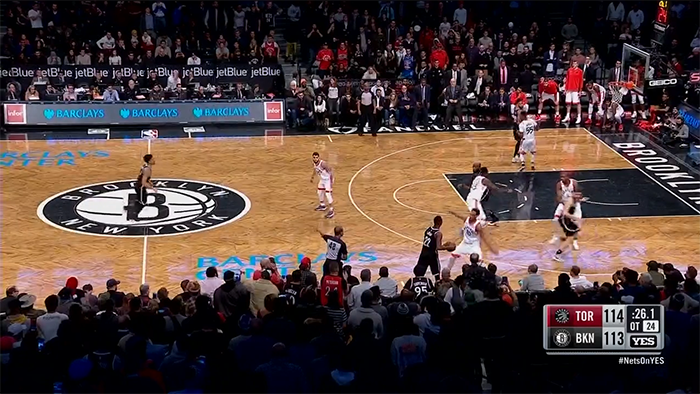 In the second play we see some interesting spacing from Brooklyn. They have 5 players on the perimeter for an isolation. And while that opens up the paint, it means there is a crowd on one side of the floor. The weakness in such a setup is that if the defense shifts appropriately and sits in the gap, the three players on one side of the floor are so tightly bunched that they can be guarded by only two defenders. And that’s exactly what happens. VanVleet sits in the gap and then even looks to double team at the end. Dinwiddie makes the right play and passes to Allen Crabbe, but that’s an easy closeout for Delon Wright, the next man over in the rotation, and Pascal Siakam is able to split the two remaining offensive players. Crabbe is forced to kick the ball back to Dinwiddie, who, with just 4 seconds left, has to put his head down and throw up a prayer.